With a chance to continue its perfect season, Boston College lacrosse headed to Durham, N.C. on Saturday afternoon in search of its second-ever road victory over Duke. Despite the high winds and pouring rain, the Eagles kept the ball rolling, routing the Blue Devils, 18-8. Both teams are used to messy weather—No. 16 Duke (7-5, 2-3 Atlantic Coast) played through an unusually wet North Carolina spring, and No. 2 BC (14-0, 5-0) has withstood precipitation, including twice this past week, all year. The conditions were so bad that BC’s softball team, which was down south facing off against North Carolina State, made the trek to cheer on head coach Acacia Walker-Weinstein’s crew, following the series finale’s postponement. Because of the weather, ball control was critical. In the first 15 minutes of the opening half, BC won seven of the game’s 10 draws, jumping out to a 7-3 lead. While it took a few minutes for either team to get on the scoreboard, it was the Eagles who drew first blood. After drawing out the shot clock, Cara Urbank capitalized on a narrow window of opportunity. She took her chance and flung a shot that slipped between Gabbe Cadoux’s stick and the pipe, watching it sink into the back of the cage as she fell to the ground. The Blue Devils responded with a goal of their own, but it was the only time they tied the game and the closest they came to BC’s lead. After Urbank’s initial goal, the Eagles couldn’t be stopped. BC soon posted three-straight goals in the ensuing 10 minutes, in large part thanks to the dangerous duo of Sam Apuzzo and Dempsey Arsenault. Duke cut the lead to one after logging two goals of its own, turning what looked to be a blowout into a one-goal game. The Eagles weren’t fazed, though. It was only a matter of time before Apuzzo gained possession and charged down the field toward Cadoux. The sophomore didn’t stand a chance against the nation’s top scorer, who bounced the ball past Cadoux to give the Eagles a bit of breathing room. The goal forced the Blue Devils to switch goalies—out went Cadoux, and in came Jamie Lockwood. Arsenault welcomed Lockwood to the field of play by immediately ripping twine, courtesy of an Apuzzo draw control victory and assist. As the half progressed, Duke struggled to stop the bleeding. The Blue Devils were helpless on the offensive end of the field, failing to build any sort of momentum throughout the period. Taking advantage of the wet surface, BC began to shoot low. As the ground in front of Lockwood became increasingly muddy, the Eagles’ attackers realized that if they aimed near the goal line, the ball would die on the ground and roll into the cage instead of bouncing back up. That said, the slippery conditions had their drawbacks: Ball security was hard to come by, and, as a result, turnovers were plentiful. BC notched 12 goals in the first half and Duke tallied five, but both teams were slowed down to just six and three, respectively, in the latter portion of play. Although Duke entered the second period with more aggression than the first—the Blue Devils rifled a shot past goalie Lauren Daly just 19 seconds into the frame—it had a hard time maintaining possession. The Blue Devils—who lead the nation with an average of 17.91 draw control victories per game—were held to just 14 on Saturday. After attempting to come back from a seven-goal deficit to open the half, it remained clear that BC was simply too much for Duke to overcome. The Eagles didn’t just rely on their top players like Apuzzo and Arsenault to lock down the win—multiple players got a chance to make a name for themselves throughout the game. Taylor Walker tied a career high with three goals, while Urbank tacked four points, more than she’s ever recorded in a single game during her two years on the Heights. Arsenault posted her own single-game high with five goals and six points, and joined teammates, Apuzzo, Walker, and Kaileen Hart who all logged hat tricks throughout the game. The Eagles, one of the two teams in the country with a perfect record, have the most wins of any top-25 team this season. 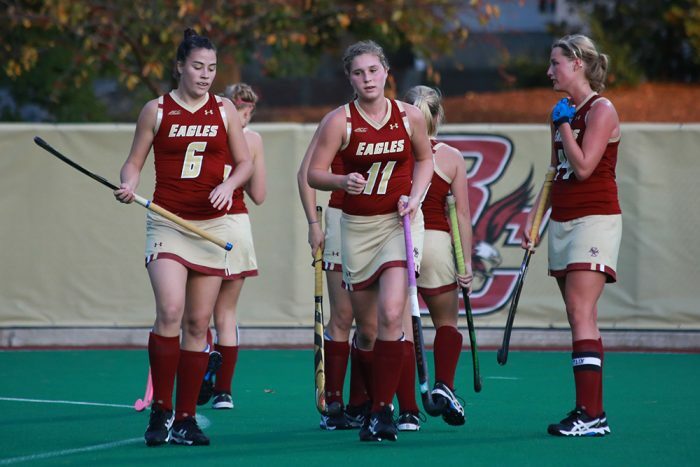 With just three games left in the regular season, it’s very possible that BC could enter the championship season much like the women’s hockey team two years ago—without a loss. The question is, will the Eagles return to the NCAA Championship, and possibly bring home a title?